Harry Belafonte first recorded the song “Matilda” as a single in 1953. It was a big hit. He re-recorded it for his second RCA Victor album in 1955, the year I was born. Why this song that I have not heard in many decades should enter my mind when I am about to crack open a bottle of Goose Island’s Belgian-style ale Matilda mystifies me. The words, the rhythm, everything about it is in my brain like something very familiar, which is not possible. OK, let me tell you another recent mind game before we get back to the beer. I never remember dreams, and, in fact, I once made fun of people who insisted on telling others about their dreams. Boring! Last Thursday night I had an incredibly vivid and complex dream that involved me paying a visit to my cousin Jeff, who is two years younger than I am and whom I have not had contact with in a dozen years. It was so vivid that I woke up thinking I had left my winter shoes at his house, and, in the waking state, was relieved to find them where I had left them the night before. Two days later, I heard from my mom that Jeff was found in a bad state by his father that Friday, and that he was not expected to live. He died four days after my disturbing dream, which is today, the day I am writing this. I used to believe I was in control, but no more. There is something else going on, and I feel completely misaligned. I’ve lost my grip. 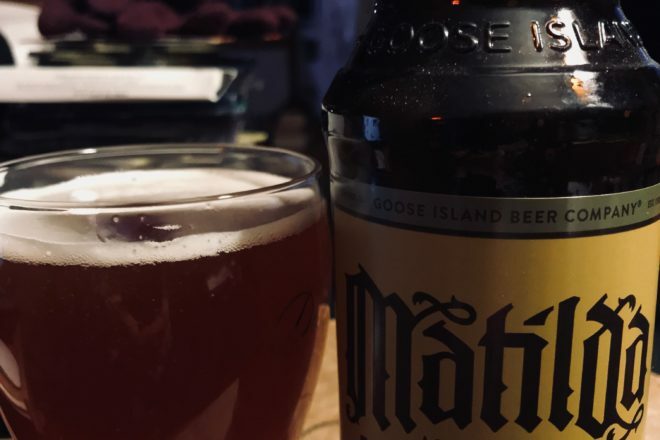 Matilda is a 7 percent “Old World” offering from Goose Island. They describe it as “golden sunrise color, dried clove and fruit aroma, spicy yeast flavor,” and since my brain is no longer my own, I will concede to their description. But I will add, it is a mighty fine brew. There is something so warm and comforting about Belgian ales. And I have to relate one more weird thing. That was my cousin Jeff’s last name.